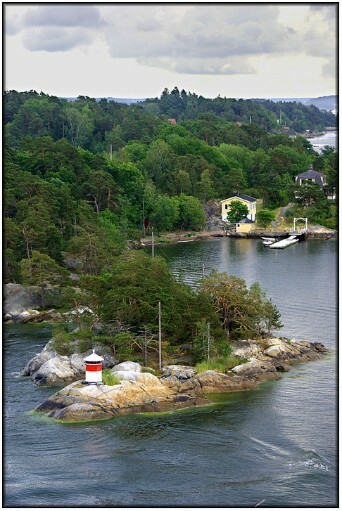 This small sector beacon is situated on the very western tip of the island of Gransholmen that lies some seven and a half miles from the Stockholm Cruise Terminal. Although the shipping channel on Google Earth is shown as passing to the south of Granholmen, on this occasion at least it is clear from my other photographs that Queen Victoria (and Sea Cloud II) passed to the north of the Island. In the image above Queen Victoria's wake is very obvious in the bottom of the shot. 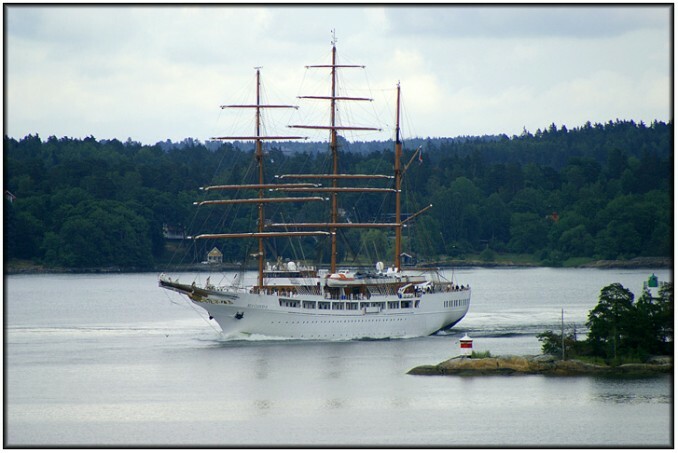 The image below shows Sea Cloud II following astern of us and just rounding the tip of Granholmen with the beacon visible in the bottom left of the photo. What is more puzzling is that there is very clearly another lighthouse visible in this shot on the extreme left and just visible above the tops of the trees. So far, I have been unable to identify this light.